Proposed internet filter will strip citizens of their rights: Your action is needed! Policy makers are working on the largest internet filter we’ve ever seen. An algorithm will decide which of your uploads will be seen by the rest of the world and which won’t. But filters often fail. Do you think there will be a way for internet users to object when their content is wrongfully blocked? Think again. Internet filters will inevitably make mistakes and wrongfully block uploads. That’s why the proposal includes a redress mechanism. Sounds good, right? If your article or meme doesn’t make it through the filters, you can just contact the platform and get it sorted out. Or perhaps even explain why, in your case, the filter should make an exception. Unfortunately, that’s not how things are going to go down. First of all: a decision to unblock your content can easily take weeks. Meanwhile, a lot can happen, and the moment you waited for to post your article or meme, the moment that was just right, will have passed. If the complaint procedure works, that’s great, but often it will be too little, too late. Secondly, filing a complaint isn’t straightforward. At the very least you’ll probably have to identify yourself and go to great lengths to explain – and prove – why your upload should have been accepted. Who wants to spend their time jumping through legal hoops, just to upload that one (legal!) video? You’ve got better things to do. So next time you make a video, you might do it without including certain footage, or a particular quote. The internet filter won’t stop you from making video’s, but it will slowly chip away at your sense of freedom. Finally, the complaint procedure will only be available to you if your content was taken down on the basis of the law. However, it is much more likely that your content will be blocked because it breeches the terms of service of the platform. Because in order to minimise risk, and make blocking less time-consuming, platforms will expand the scope of their terms of service to be able to delete any content or any account for any reason. That will leave you with no right to complain – even if your content was perfectly legal. The following weeks are crucial. Call, tweet or e-mail your representatives that are part of the European Parliament’s Committee on Legal Affairs (JURI). On 20-21 June they will be deciding on the upload filter. 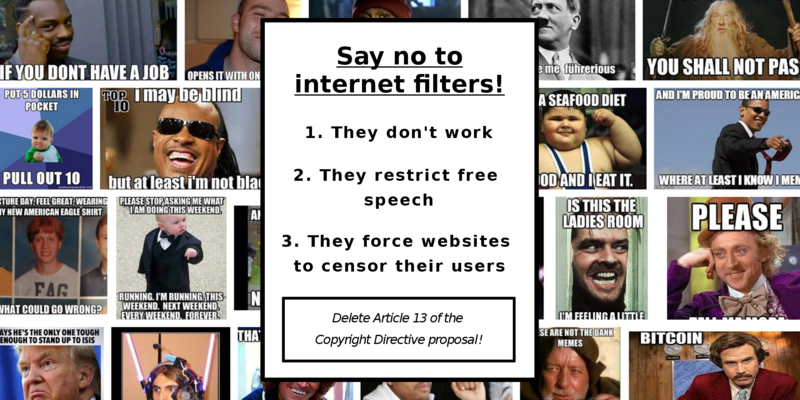 Use the hashtag #CensorshipMachine or #FilterFail and let your representatives know you’re against the internet filter (Article 13)!